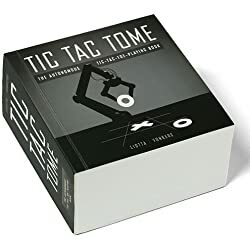 Tic Tac Tome the Autonomous Tic-tac-toe-playing Book Note: this review is from the republished version of the same name by Willy Yonkers, Quirkbooks, June 2010. A book that can beat you at Tic-Tac-Toe? Thats what the author says anyway. If the book is really that good, I must be the best Tic-Tac-Toe player ever. This is a massive book. About 3-4 inches thick (and only 4×4 in size) with like a thousand pages. Whats interesting is that this could be an app with maybe 40-50 kb worth of data. Its big but really simple. You choose where you want to place your mark (O or X) and turn to the designated page. On that page youll see your mark and also the books next move. Repeat. Repeat. Cats game. Pretty much every time.